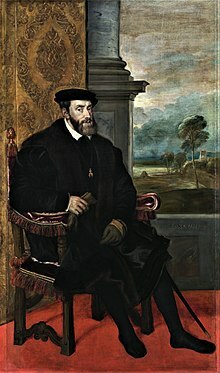 Charles V (German: Karl V.; Spaingie: Carlos I; Croatie: Karlo V; Dutch: Karel V; Italian: Carlo V; Czech: Karel V.; French: Charles Quint; 24 Februar 1500 – 21 September 1558) wis ruler o the Haly Roman Empire frae 1519 an, as Charles I, o the Spainyie Empire frae 1516 till his voluntary retirement an abdication in favor o his younger brither Ferdinand I as Haly Roman Emperor an his son Philip II as Keeng o Spain in 1556. ↑ Abdication of Brussels. Books.google.es. Retrieved 2012-06-08. This page wis last eeditit on 13 Apryle 2019, at 11:55.